This is my very first blog post so I’ll take the time out to introduce myself and what I am about. I am a 22 year old female living in the beautiful city of Melbourne, Australia. I work in two jobs I absolutely adore while also studying. To be honest, I’m not your average girl. I never considered myself to be a “girly girl”. I grew up in a household with 3 brothers, this meant a lot of car talk, and a lot of ‘rough and tumble’. I love cars, technology, food, psychology….and I absolutely love fashion. My love is undeniable. It is an obsession. There are many reasons why I love fashion, the main reason being, this: personality. I adore that we can customize ourselves, wearing our personalities ‘on our sleeves’. What we wear can give people a little glimpse inside our personality. I am a massive fan of the 60s and 70s. Honestly, I think I was born in the wrong generation (even my friends tease me). A lot of this comes down to modesty and elegance. I believe you can look truly and undeniably gorgeous, without showing a lot of skin. I’m a huge fan of long length skirts, pants, thick wooly jumpers and so on. Winter is probably my most favourite season for fashion and accessories. Another huge thing I’m about is quality. Quality over quantity always! I would rather spend a little extra and buy something I absolutely love (to the point where I just will admire the piece for days on end). I’m RARELY a impulse shopper. Everything I buy, I put a lot of thought into…A LOT! I work extremely hard for my $’s so when I’m buying something I really want to make sure that it is worth it. Due to this, I’ve become obsessed with Australian and International Designers which you will soon come to realise as well…. I’m slowly growing a collection of pieces which I hope will last long enough to pass on to my children (in the very FAR future). P.S. I’m a huge fan of Alice in Wonderland- not just the story but the writer as well. Hence ‘Andrea in Arcadia’ (or, my version of anyway). Autumn has officially ended. 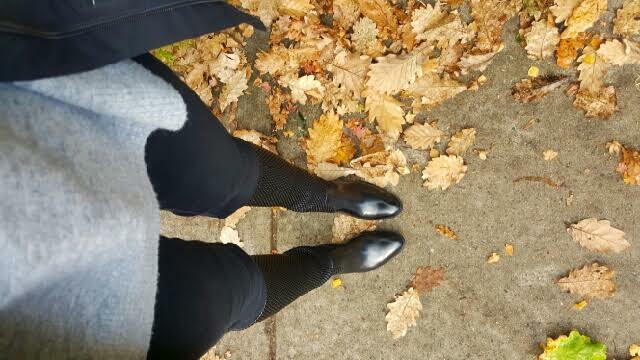 Wearing Witchery boiled wool knit and Italian made, Australian designed leather boots by Habbot. 7 replies to Hello world! Thank you Emma 🙂 Will post again very soon!